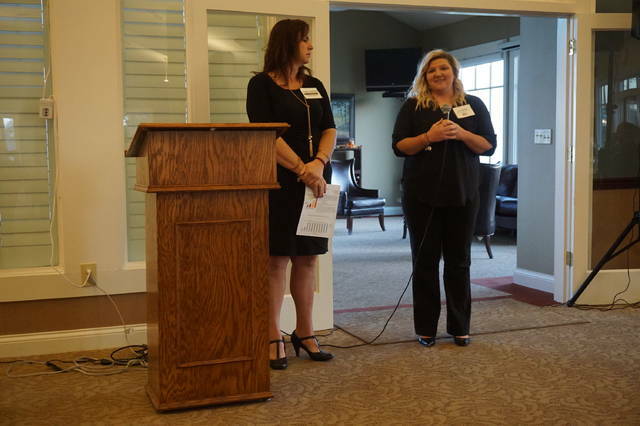 Big Walnut Superintendent Angie Pollock, left, and bond/levy issue campaign chair Tara Shelby speak at a Sunbury/Big Walnut Area Chamber of Commerce event last Friday. The Big Walnut Local School District is back on the ballot after last year’s defeat with a combined bond issue and permanent improvement levy. “We’re trying to be proactive and prepare for the growth that’s coming,” said Superintendent Angie Pollock at the Sunbury/Big Walnut Area Chamber of Commerce candidates’ breakfast on Friday. According to the district, there were 3,734 students this summer; with projected enrollment figures of 4,372 in 2020 and 5,452 in 2025. The total ballot millage is 7.85 mills — a $108 million, 6.6-mill bond and 1.25-mill permanent improvement levy. There would be a three-year phase in, Pollock said. Big Walnut, which has received “Excellent with Distinction” report card ratings in the past, continues to achieve academically under the state’s new grading system. “We have the highest Grade Point Average in Delaware County, and one of the best in central Ohio with the lowest millage,” Pollock said. Pollock will answer questions about the Nov. 7 ballot issue from 6 to 7 p.m. on Wednesday, Oct. 25 and from 7:30 to 9 a.m. on Friday, Nov. 3 at the Sunbury/Big Walnut Area Chamber of Commerce’s meeting room, 39 E. Granville St., Sunbury. Facebook responses to recent news articles have mostly favored support for Big Walnut. In addition, informal discussions with people who have ties to the district either as residents or stakeholders reveal a guarded optimism that the bond/levy will pass this time around, and that last year’s defeat was in part due to an unusual national election. Contact Gary Budzak at 740-413-0906. Follow him on Twitter @GaryBudzak.